Kanye West is set to keep his album-releasing streak going strong later this week with the arrival of Nas' latest album, and now Kanye has unveiled what will likely be the final tracklisting for that LP. Like the rest of G.O.O.D. 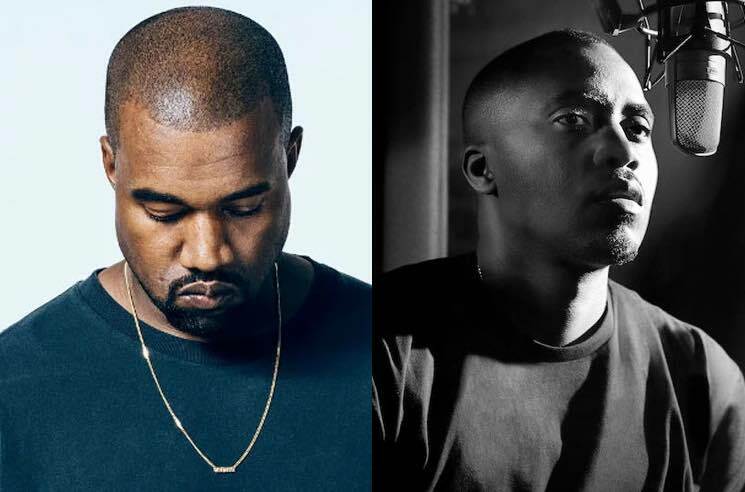 Music's recent releases, Nas' record — which is being produced by Kanye — is set to feature seven songs, and the previously teased track "Everything" still appears atop the list of song titles. Other tracks on the way include "Not for Radio," "Adam and Eve" and "Cops." See the full tracklisting below. See a few other updates from West on the upcoming Nas album below. Just wanted to say I'm up in the morning working on the Nas album and I'm so humbled by all the love we're getting on these albums. We're still the kids we used to be. We're here creating in real time just having fun. I hear the albums blasting out of the cars when I walk down the street. Kids come up to me and tell me their favorite songs. We're experimenting with new sounds structures and ideas. So far, the album itself hasn't been given an official name, but we won't have to wait long to find out what it is — the record is out this Friday (June 15). Pick up Kanye West's new album ye and his Kids See Ghosts collab album with Kid Cudi (or both!) via Umusic.